A disabled mailbox in Exchange signifies that it is no longer associated with Active Directory user account. 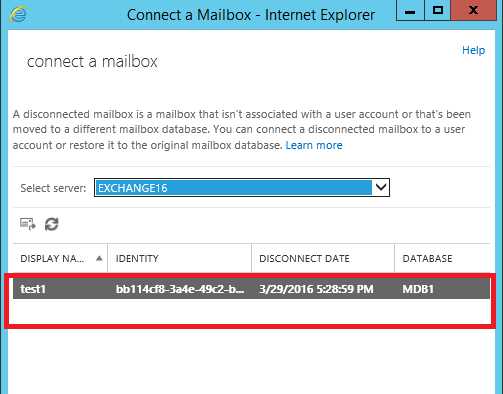 Whenever an administrator disabled the mailbox, Exchange Server stores disconnected mailbox in the database. It only eliminates all MS Exchange attributes from its associated Active Directory account. Sometimes, the administrator required to restore disabled Mailbox in Exchange 2016. Hence, it is possible to enable disconnected mailboxes until its retention period has lapsed. Because, once the retention time gets expired, the removed mailboxes will delete permanently. 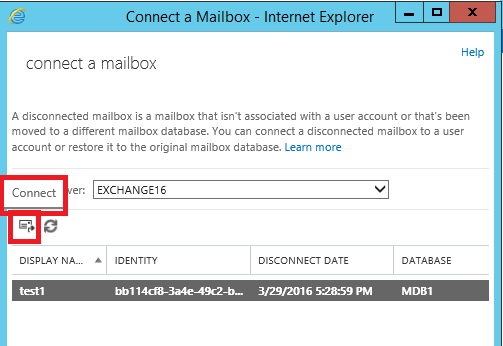 In this guide, we are going to show how to enable disabled mailbox in Exchange 2016 in an efficacious manner. In the following section, readers will know the complete procedure to recover exchange mailbox back that is disabled from the Exchange Server in a detailed manner. Basically, the entire procedure classified into three steps. So, let’s get started! By using Microsoft Exchange Management Shell, one can easily get the list of all disconnected mailboxes from Exchange database. In order to get the record of disabled mailboxes, use the below-illustrated command in EMS. With the help of above cmdlet, the complete list of the disabled mailbox will display on the screen. Now, we need to connect the mailboxes to Active Directory account in order to restore disabled mailbox in Exchange 2016. In such a situation, when there is no account available in AD, create it first before restoring the disabled mailboxes. After that, connect the disconnected mailbox with it. Originally, there are two ways to again add the mailbox with AD user account i.e., EAC and PowerShell Method. Here, we describe both the method in a detailed way. With the help of this workaround, one can also add the disabled ‘shared’ or ‘linked’ mailboxes with the Active Directory of user account. Now, follow the below steps sequentially and reconnect the mailbox. 1. In EAC (or Exchange Admin Center), click on Recipients >> Mailboxes. 2. After that, click on More… and select Connect a Mailbox option. Note: The mailboxes that are disabled on the chosen Exchange Server will appear. 3. Next, you need to select the disconnected mailbox that you wish to connect back together and click on Connect. 4. A pop-up message appears on the screen that asks you to re-establish the mailbox or not. You need to click on Yes button to proceed further. A user can restore disabled mailbox in Exchange 2016 using Exchange Management Shell by using Connect-Mailbox command. However, a user has to mention the mailbox type such as ‘Disabled’ that you are going to be reconnected. Now, this is the standard syntax that use to reconnect the disconnected Exchange mailbox. 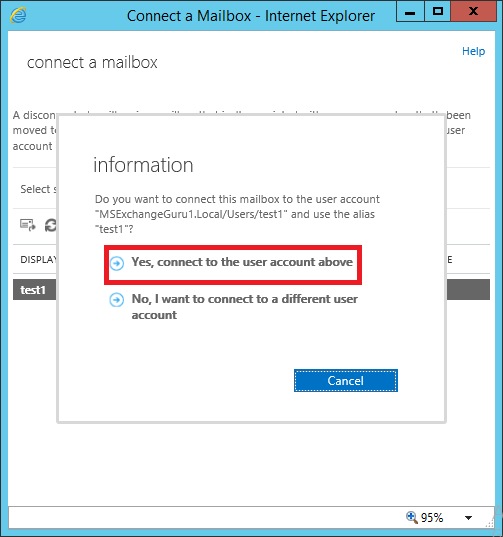 Once you have done with the above step, check that the disabled mailbox in Exchange 2016 successfully connects with Active Directory user account or not. To do this, follow any of the below methods. 1. Go to Recipients from the left side navigation panel. Thereafter, navigate to the relevant section to get the list of connected disabled mailboxes. 2. After that, click on Refresh Icon to check that mailbox is listed or not. 1. In AD user account, perform right-click on the chosen account whose mailbox was disabled and select Properties. 2. Under General tab section, you can clearly see the box gets an email address for the corresponding reconnected disabled mailbox. You just need to change ‘Identity’ with the user account and execute below-mentioned cmdlet. The status of UserMailbox tells the whether the mailbox is connected with Active Directory user account or not. A user can also use Get-Mailbox command for the same. Above method can be used while working with Exchange environment what about the mailboxes stored in Disconnected and orphan Exchange Database file. To restore and reconnect all these mailboxes, you can try SysTools Exchange Recovery Software that preview completed list of mailboxes stored in EDB File and allow you to restore again in the different live Exchange environment such as 2016, 2013, 2010 and below versions. To know how to restore disabled mailbox in Exchange 2013 & 2016 environment, Administrator can try PowerShell command & Exchange Administrator to manage the user’s mailboxes. An Administrator can Add, Delete and manage permission of the Exchange user’s and in the above section, we discuss some command that helps you to connect the disabled mailboxes again in production so that can be used again.